We offer various guided tours and sightseeing city tours through the diverse districts of Barcelona with many interesting topics especially for groups of 10 people or more. 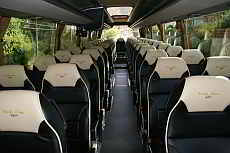 If you want to travel to Barcelona as comfortable and relaxed as possible, our arrival sightseeing tour is ideal. 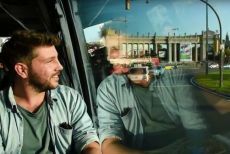 Are you coming by your own bus? 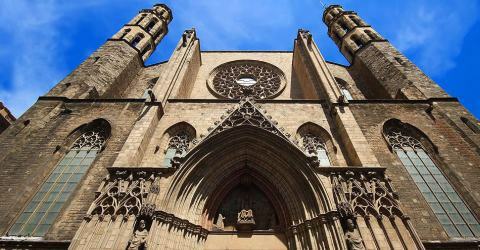 No problem, our tour guide joins you and shows you the places of interest in Barcelona. We adapt to your wishes! We show you sights and hidden places in a district that is not yet in the focus of tourism. You will receive an insight in the colourful and cultural diverse district. For a better understanding we use a modern audio system. 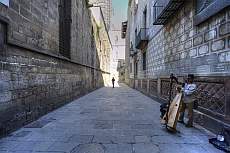 In entertaining and exciting stories our guide will take you through the Barri Gòtik, the historic center of Barcelona. For a better understanding we use a modern audio system. 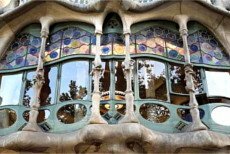 Experience an entertaining guided tour along famous houses of the Catalan Art Nouveau style with interesting information about this era. The Modernisme is omnipresent in Barcelona. 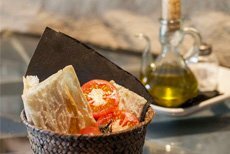 Spend the evening together in Barcelona and get to know Spain in a culinary way. Our tapas Tour is just perfect for that. For groups up to 20 people. 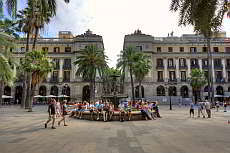 Experience with your group the picturesque district of El Born with its winding, medieval streets and decorated with plants and flowers balconies. Book the private tour for your group! 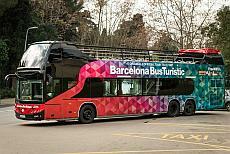 In the open top deck of the convertible buses you will have a great view of the sights of Barcelona. The buses run on three lines through the city and you can get on and off at any stop. You can get the tickets here with a group discount of 15% (starting at 10 tickets) on the regular price. 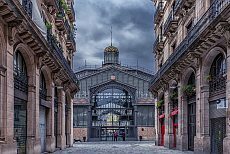 Your trip to Barcelona cannot start any better: For our Arrival Sightseeing Tour our English speaking guide will pick you up at the airport and will show you the most beautiful places Barcelona's. The trip ends at your hotel. On request including a tapas break with a beautiful view of the city. Our English-speaking guide will show you Barcelona's most beautiful places. We offer the tour at a favourable price for smaller or larger groups: on a people carrior for up to 6, a mini bus for up to 18, a midi bus for up to 31 and a travel bus for up to 54 passengers. Our tours take place in small groups. If you are a large group, we share them and go with several tour guides so that all participants can follow the explanations well.